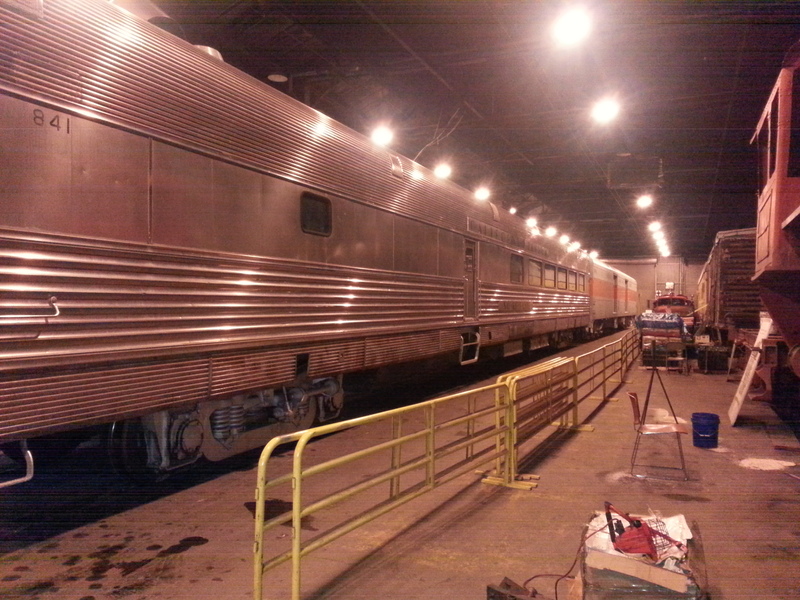 Continuing in a long tradition of efficient night work projects, the baggage car and Silver Plate have been switched into the shop in preparation for Santa Trains. Fritz and Poindexter switched the cars around using former US Army 1857, a Fairbanks-Morse H-12-44 locomotive, directed by Yardmaster Steve Habeck. Just a reminder, there will be THREE Santa Trains this year, on the first, second, AND third Saturdays of December, starting at 5pm. Volunteers can sign up on the i-volunteer website. The Baggage Car and Silver Plate in their Santa Train location. Admission for the Santa Train event will be $10 per car, or $5 with a donation of three canned food items. Full details can be found on the WPRM website: http://www.wplives.org. This entry was posted in Operations, Santa Trains and tagged Around the Museum, Santa Trains. Bookmark the permalink.